I was on GO train from Toronto to Oshawa on April 26th at about 4pm when I saw what at first I thought was a Turkey Vulture as per normal as my train was pulling into Rouge Hill Station. When I looked again I realized it had a white head and a yellow beak! I knew right then that it was a Bald Eagle! I shouted out loud that was what it was, and some people saw it, but most were too busy texting or playing games on hand held electronics! This was the first one I have seen this far south in Ontario in over 50 years of wildlife watching. I wish I had a picture of it but as my train was going East and it was soaring West I will just have to hold the pic in my head! Look out the window! You are missing life slowly glide past you! Thanks, Frank, for sending us this report of your Bald Eagle sighting - I know you couldn't send a picture, but I found one to add to your report! I will also post this on our facebook page for our facebook followers to enjoy. I saw a Bald Eagle catch a rabbit 3rd concession in Cherry Wood February 27 and on Feb 28 I saw 2 in the treeline on Rosebank Road. Possibly saw one this evening in Whitby by Lakeridge and Dundas. Thought it was vulture at first but white head and neck more like Eagle. Didn't realize they were in this part of Ontario. I've seen one 3 times in the past year around the area of Lake Ontario and Frenchman's Bay in Pickering. Stunning creature! Amazing to see one in the GTA Frank. I just had my first Ontario Bald Eagle sighting just this past weekend, outside of Leamington. It was quite a thrill - especially because I wasn't searching for any wildlife at all. I immediately wondered if any are spotted around these parts (Toronto) and found your post. Is the Rouge the most likely place to see a Bald Eagle? (the Rouge is particularly appealing as I don't drive & a shuttle is offered from downtown).What times of year would they be here? The entire year? Could make for a fun fall excursion. A couple of weeks ago (I don't recall the exact date, but I'm guessing roughly within the same time frame as the original post) I saw one from the Go Train as well, late afternoon in the Pickering/Ajax area, sitting in a tree on the edge of a field, south of the Go Train tracks. I was amazed, first time I'd seen one in Ontario. I even went to Google to see if the north shore of Lake Ontario was even within their known range. It's nice to see some species seemingly making a comeback. 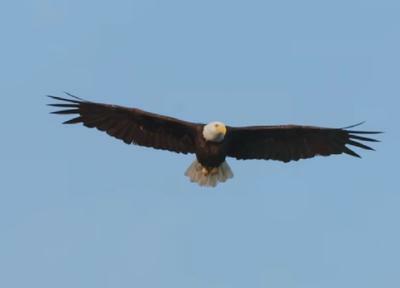 Thanks for your note regarding the Bald Eagle...I hope you see it again. I am sure you will be looking and have your cell phone camera ready to snap. I now live in Ridgeway, Ontario, but know the area you are speaking about, and I remember there was a lot of controversy about construction in the area and losing the wonderful trails and bush. I hope that has been saved. I like your advice on life ... look out the window, life is passing you by ... excellent advice related to everything in our everyday lives.